What is the difference between the unregistered version and registered one? No watermark of string "Trial Version" when business cards are saved to image files or printed by using the registered version. How to print business cards from printer by Business Card Designer? Printing is the final output of your business card. You can print your card to any Windows compatible printer. 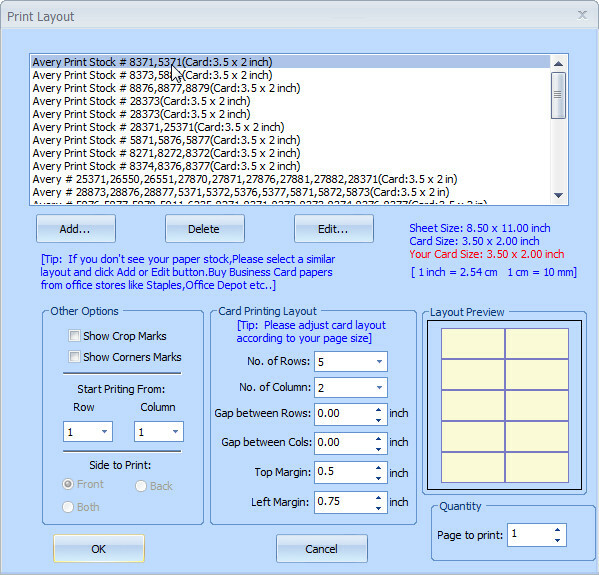 Select "Print" menu item then it popups the dialog box for editing print layout of business cards. Add: Add a new created print layout which is created base your selected layout and can be changed with your own settings. Delete: Delete the seleted print layout. Edit: If you see your paper stock, please select a similar layout and then click Edit button to modify untill you want. Pages to Print: Enter the number of pages to print. Each page will print one or many cards depending upon other options. No. of Rows/Columns: You can print many cards on one page to maximize your page usage. Enter how many rows and columns of cards you want to print in one page. These numbers will depend on the size of your printing paper. Gap Between rows/columns: You can choose to space out the printed of cards in one page, so that you get some room while cutting the page to separate out the individual cards. Top and Left Margin: Printer will leave these margins on top and left of the paper while printing out the cards on each paper. This is very helpful for business card papers that come with margins. Show Crop Marks: These are the marks that are printed at the top and left of the paper to show the position of each row and column to help you cut the printed paper. Show Corner Marks: These are the marks that are printed at top-left and bottom-right corner of each business card to help you cut the printed paper. How to save my business cards to JPG, PNG or other image format files? After you have completed your business card design, you can save the file as an image for sending to someone or for outside printing. Browser: Click to choose a folder, file name and an image format to save. 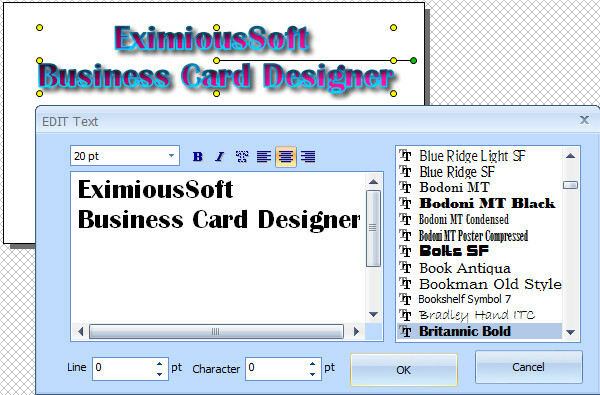 Business Card Designer supports these file formats for saving as image: jpg, gif, bmp, png, tif, tag, pcx etc.. You can open the saved graphics using any standard picture viewer (e.g. Microsoft Paint, Microsoft Photo Editor, Adobe Photoshop) or email to someone, or bring it to a local print shop to have professional copies printed. Print DPI: While saving as an image you can choose to save at a very high resolution image for better print quality. Business Cards Designer can save upto 600-dpi(dots per inch) resolution. While 300-dpi is sufficient for most good quality printing, but you can save at dpi higher than 300 also. When saving at higher dpi the file size becomes bigger. Sides to Export: Select front side or back side or both of them for export. 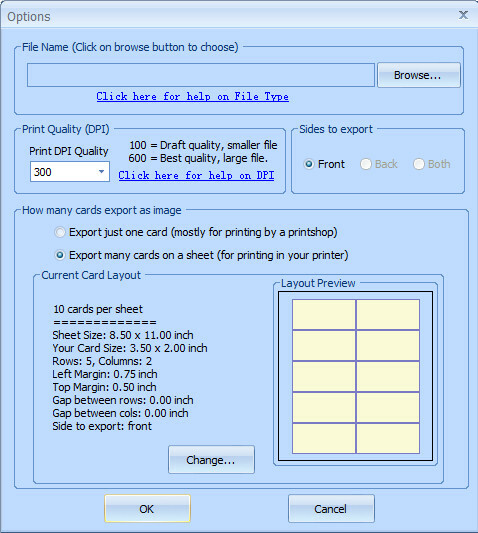 Change: Click to change the print layout while export many cards on a sheet. How to create an attracitve shape or text object for business cards? Business Card Deisnger provides many of the visual effects which is used to produce highly visual impact shape grapchis. (1) Switch to "Selection Tool" mode if not, then select the shape or text objects which you want to change. Related FAQ: How to select one or more objects at a same time? (2) Open "Home" category in main ribbon bar, then go to "Effects" sub-category. Choose a render effect such as Drop Shadow, Reflection, Outer Glow, Bevel Edge, Texture etc. or combination some of them. Then the selected objects are shown with the render effects. Typically, each effect contains a different set of options, you can give your own settings for them according to your needs. How to add shapes or symbols into my business cards? Go to "Shapes" View. If it is not visible, If not, switch to "View" category and make the check box which named Shapes List is selected. Then choose a suitable shape classification from the list. Find a shape which you want to add, click on it to select and then keep left mouse button is down, then drag it into workspace. Also Double Click on this shape for adding it to workspace directly and it will be centered in Design View. In the main ribbon bar, open Design category, you will find the most commonly used shapes which are listed in toolbar. Select a shape, drag the pointer across design view to draw the shape until the desired size is reached, then release mouse button. How to add a text or an image into business cards? Add Text: Open "Home" category and then click "Add Text" tool button on main ribbon bar, a new text object is created and show centerly in Design view. After that, a dialog box is popups to prompt you for editing the text. Add Image: Open "Home" category and then click "Add Image" tool button on main ribbon bar. It opens Windows open dialog which prompts you to select an image file for loading. How to select one or more objects at a same time? The multiple objects are allowed to be selected at the same time in Business Card Designer.The standard Windows multiple-selection shortcuts of Ctrl+click and Shift+click is supported by the program. Two ways are offered for selecting objects. In Design View, each visible object is shown as it should be. When an object is selected, the handles for rotation and resize the object are shown around it, but none for the unselected one.for example, see following screenshot,The left object is selected, but right one is not. Click: click the left mouse button on the object you want in Design View, then the previous selected objects become unselected while the clicked one is selected. Click + Shift: press the Shift key and keep it down, click with the left mouse button on the object you want in Design View, then the clicked object is selected and add it to selected objects list. Click + Ctrl: press the Ctrl key and keep it down, click with the left mouse button on the object you want in Design View. If the object is selected already, then it will be become unselected, otherwise it is selected after it is clicked. How to group the selected shape or text objects? (2) Open "Home" category in main ribbon bar, then go to "Arrangement" sub-category. Click "Group" tool button and then choose "Group" sub-menu item. Which group all selected object together so that they are can be treated as a single object. Notice: If you want to ungroup an group object, please select "Group-->Ungroup" menu item. How to change text's font name, font size, or other attributes for a text object? Business Card Designer provides two ways to help you to edit texts. (1) If the text object is not selected, you need to select it as flowing: If the appliaction is not running in Select Mode currently, click "Selection Tool" tool button on toolbar to switch. then click the text object you want to change to select it in the Design View. Then right click to popup context menu and choose "Edit Text..." menu item for editing. (2) Double Click on the text object in Design View directly for editing. After that, A dialog box is shown as following screenshot which prompts you to edit text visually. How to fill and stroke specified shape or text objects? (2) Open "Home" category. Go to "Fill inside" sub-category then selete a menu item for filling the selected objects; Go to "Stroke Outline" sub-category then selete a menu item for stroking the selected objects. ▪ Solid Color: Fill or stroke the selected objects with a solid color. ▪ Gradient Colors: Fill or stroke the selected objects with gradient colors. ▪ Image: Fill or stroke the selected objects with an image. How to create a unique shape by EximiousSoft Business Card Designer? Business Card Designer offers Custom Shape Tool to draw your own shapes. Open "Home" category from main ribbon bar, and then click "Custom Shape Tool" tool button. 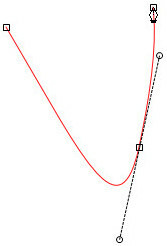 (1) Click to define the started anchor point (do not drag). (2) Click again where you want the segment to end. 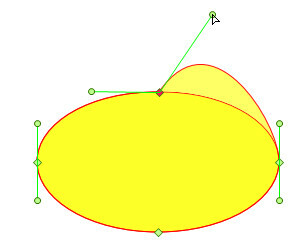 (1) Position the Pen tool where you want the curve to begin, and hold down the mouse button and drag. The started anchor point and started direction line appears. 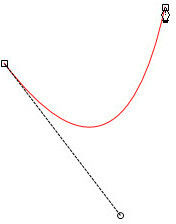 (2) Drag to set the slope of the curve segment you’re creating, and then release the mouse button. Note: In general, extend the direction line about one third of the distance to the next anchor point you plan to draw. (You can adjust one or both sides of the direction line later. 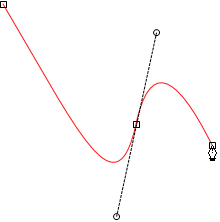 ▪ To create an C shaped curve, drag in a direction opposite to the previous direction line, then release the mouse button. 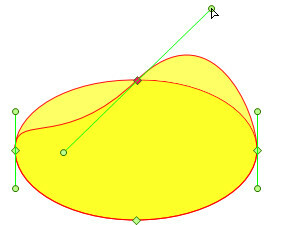 ▪ To create an S‑shaped curve, drag in the same direction as the previous direction line, then release the mouse button. ▪ Continue clicking to set anchor points for additional straight segments. ▪ Continue dragging the Custom Shape Tool from different locations to create a series of smooth curves. Complete the path double-click anywhere. How to add or delete anchor points from a path? Adding anchor points can give you more control over a path, or it can extend an open path. However, it is a good idea not to add more points than necessary. A path with fewer points is easier to edit, display, and print. You can reduce the complexity of a path by deleting unnecessary points. (1) Open "Home" category in main ribbon bar,and then click "Add Anchor" tool button. (2) Click to select the shape its path is you want to modify. 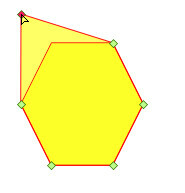 (3) Position the pointer over the path segment, and click to complete adding an anchor point. (1) Open "Home" category from main ribbon bar,and then click "Delete Anchor" tool button. 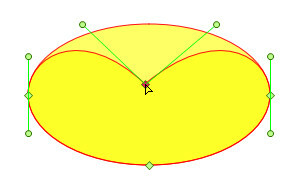 (3) Position the pointer over the anchor point,and click to complete deleting the anchor point. How to reshape or edit a path for a shape? (1) Open "Home" category from main ribbon bar,and then click "Move Anchor" tool button. (2) Before you can reshape or edit a path, you need to select the path's anchor points, segments, or a combination of both. Note: If you can not see the points, you need click the shape to select it which you want to modify its path.then click to select the anchor point you want to move. (3) Click to select the shape its path is you want to modify. If an anchor point connects two segments, moving that anchor point always changes both segments. (1) With the Move Anchor Tool, select the segment you want to adjust. (2) Drag the segment's anchor point to its new position. 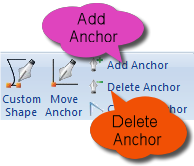 (1) With the Move Anchor Tool, select an anchor point on the segment you want to adjust. ▪ To adjust the position of the segment, drag the segment's anchor points. ▪ To adjust the shape of the segment on either side or both sides of a selected anchor point, drag the anchor point or the direction point. Copyright © 2005- EximiousSoft Team All Rights Reserved.